Driving North on IL Route 12 (Rand Road): Turn right at Wilmot Road and proceed North to Wilmot High School. Driving North on I-94: Exit at Illinois 173 West. Go to Wilmot Road and proceed North to Wilmot High School. Driving South on I-94: Exit at Highway Wisconsin 50 West. Take 50 West to Route 45 South. Go south on Highway 45 to Highway C and turn West to Wilmot. Thank you for your interest in the Harmon Hundred! Your participation helps support the club's advocacy efforts on behalf of all cyclists. On site registration is from 6:00am to 10:00am. No refunds. We ride rain or shine. Note that we do NOT offer T-Shirts again this year. A non-competitive, scenic ride of 25, 50, 75 and 100 miles. Well marked and quiet country roads, cue sheets, SAG support, friendly volunteers and our well-stocked rest stops that receive RAVE reviews every year. Free showers will be available after the ride. BRING YOUR OWN TOWEL. Files will be available about a week before the ride. Please check back later. All routes open at 6:00am. Century riders should begin no later than 8:00am. All riders must plan to complete their rides by 4:00pm when all routes close and SAG support stops. Obey all applicable traffic laws. Helmets, which comply with "U.S. CPSC Safety Standard for Bicycle Helmets", are required. Ride within your ability and physical condition. Bring a bike in good condition, with a spare tube, basic tools, a water bottle, and basic knowledge of repairs. Children must be accompanied by an adult throughout the ride. The routes are on public roads which must be shared with motorists. Local law enforcement authorities may patrol the roads and may issue citations for traffic violations. Bicycles should be ridden single file at all times, even when traffic is not present. State law prohibits the use of headsets while riding on public roadways. A wristband will be issued to each registered Harmon rider. SAG service and rest stop services will be available only to those riders wearing wristbands. The Harmon Hundred is on Facebook. Click for additional information. Remember to "LIKE" us. Why is it called the Harmon Hundred? 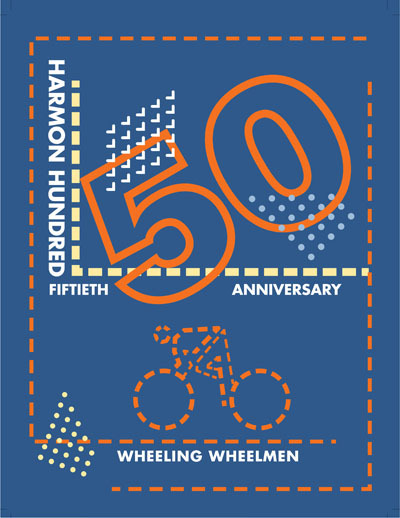 Click here to see the history of the Harmon Hundred as featured in "Chicago Athlete"
Your participation helps support the advocacy work that the club performs on behalf of all cyclists. We support the League of American Bicyclists, League of Illinois Bicyclists, Active Transportation Alliance, Bicycle Federation of Wisconsin and Buffalo Grove Bike Rodeo.